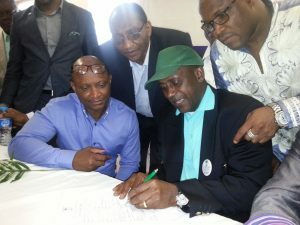 Dr. Kandeh Kolleh Yumkella, alias KKY, formally resigned from the Sierra Leone People’s Party few weeks ago after years of intraparty gymnastic full of oral and physical abuses. KKY’s resignation came as no surprise to many after he suspended his campaign for the party’s flagbearer race two months earlier. 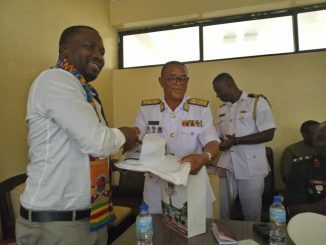 What was a bit surprising however, is his quick declaration for the National Grand Coalition Movement (NGC), a new political party that is yet to be granted proper legitimacy by the Political Parties Registration Commission. 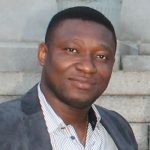 Many sources had earlier speculated KKY’s alliance with exiled Vice President Sam Sumana in an unknown coalition, but what remained a fact until his official resignation, is that despite all the challenges he faced from the Paopa clan within the SLPP, he became an accepted member of the party after years of rejection. In his resignation speech, KKY categorically announced his readiness to join the NGC shortly after the occasion. He also disclosed that many prominent members of SLPP, including the erstwhile Vice President Albert Joe Demby, were ready to go with him. He then asked the entire membership of the KKY Movement to follow suit. Many political analysts believe that KKY had already joined the NGC before his official resignation from SLPP. Whatever the case might have been, we now know that the global KKY Movement is going to be metamorphosed into NGC. What is the KKY Movement? The idea of KKY movement evolved far back in the years 2012/2013 shortly after SLPP lost the last elections. It was brought about by SLPP supporters in the diaspora who fancied Dr. Yumkella as a better alternative to the likes of Maada Bio and others for the SLPP flag. The idea was based on their loyalty to SLPP, love for their county and hope for a better future based on their understanding of democracy in development context. KKY himself was still a plenipotentiary servant of United Nations at the time. As it’s always the case in Sierra Leonean politics, few others later joint the group because of their regional, tribal or family relationship to KKY. The man himself openly admitted his leadership of the KKY Movement after he gave up his job at United Nations in early March 2015. Thenceforth the battle for legitimacy in the SLPP began. According to what I culled from the homepage www.kkymovement.org, “the KKY movement supports, advocates and campaigns for KKY because the vast majority of Sierra Leoneans believe that only a person with his experience, skills, knowledge, capacity and ability stands a chance of leading our Nation into a new era of Economic Transformation, Growth, Job Creation and Social Justice. 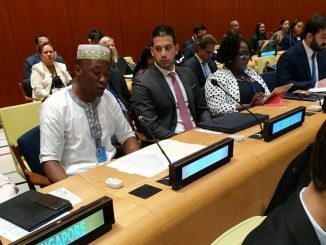 The movement will be engaging in fund raising, community engagement and awareness programs, campaigns and various developmental programs – all in the name of KKY and for the sole purpose of promoting and advocating his bid for the 2017/18 Presidential elections of the Republic of Sierra Leone. “1. Open, inclusive, accountable, transparent government and society that respects the rule of law, fundamental human rights and constitutional order. Sound fiscal principles to ensure a strong, robust and diversified economy and structural transformation to ensure creation of wealth and decent jobs. Empower our youths especially with literacy and employable skills to ensure they realize their full potential in society. Promote social justice and progress including investments in education, health, agriculture and women’s economic empowerment. The above can be simply understood as summery of KKY’s political manifestos. It’s a true political group with distinct dreams for a better future for our country. The only thing it lacks is political legitimacy because it’s not registered as a legal entity in Sierra Leone. From development point of view, I would like to refer to the Movement as a social initiative that cannot be prosperous without answering the so-called five “W” and one “H” questions in its visions and objectives: What/who do we want? Why do we want it/him? What can we/he do to achieve our dreams? Where can he/we get the chances/resource to do it? When can we/he achieve it? Certainty, the Movement has provided answers to all the above questions except one: “H”, which means “How” can he/we do it? The “How” explains implementation strategy in project. This is what determines outcomes of polls in well developed and democratically civilized nations. The “how” must be conceivable, attainable and acceptable to the voters before going to the poll. Unfortunately the average Sierra Leonean voter does not ask any politician to explain the “How” of their promises. Was there any Plan B? When the Paopa predominated SLPP leadership began resisting KKY’s membership of SLPP – hence his participation in the flagbearer race, some people began looking at the KKY Movement from different perspectives. They began calling vociferously in the social media for the transformation of the Movement into an independent political party. Regardless KKY’s claim that he had a sentimental attachment to the party which is why he found it hard to let go, there were other fundamental factors which they (callers of a KKY party) never took into consideration: 1) it was crystal clear that only a handful of the KKY activists are true fans of his personal identity. Majority are diehard, disgruntled and displeased members of the main SLPP who were yarning for positive change in the party and who thought KKY can be the best man to bring about that change. So there was no assurance that they would leave SLPP and follow him elsewhere. 2) In the interiors where SLPP has its strongholds, only brave members of the Movement came out openly and said it, but majority of them remained unknown up till now due to security reasons, after they witnessed how the Paopa clan muffed KKY and his closest disciples during the fight for his membership of SLPP. 3) Perhaps the most important factor which I’m sure KKY himself is fully aware of, is that Sierra Leoneans mostly vote for tribal, regional and party identities, regardless the characters who represent those identities. KKY being a development expert with the ability to mirror the Sierra Leonean political landscape from many perspectives, he knew that transformation of the KKY movement into a true political party could not be an easily workable plan B, because it would require him to present three new identities to the Sierra Leonean voters at the same time: new party symbol, new political candidate and new political philosophy, which would have cost him 100 times the cost of SLPP flag. This is why it was necessary for him to maintain his ground in the race for SLPP flagbearership. Unfortunately he couldn’t continue… In a nutshell, the KKY Movement had no workable plan B. Why NGC, is this the best alternative? 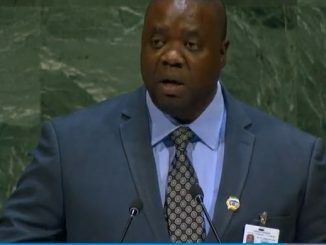 When keenly looked at the situation KKY found himself in within the SLPP, particularly the way and manner he was constantly demeaned by the Paopa clan, many independent observers, including myself, believe that his earlier withdrawal from the flagbearer race was the noblest decision and his final resignation is the bravest thing to do. We know that the Movement had reached a crossroad where it needed to find a headway into the political circle. It’s also a fact that the Movement was forced to join an existing political party because it had wasted too much time running after leadership of an opposition party that prioritizes identity over numbers. What is critically questionable however, is KKY’s decision to join the National Grand Coalition. I could see that this decision has generated more cons than pros in KKY’s political agenda. Because there are some critical questions which every sincere supporter of KKY shouldn’t forget to ask right now: if KKY was not a shadow member of the NGC before his resignation from SLPP, how quick can he align his Hope, Opportunity and Transformation agenda with the NGC? Every political party should have a distinct philosophy which shouldn’t be the same or too similar to that of its opponents; what was the NGC’s existing philosophy before KKY joint it and how dissimilar is it from APC and SLPP? How high is the prospect of the NGC’s chance to participante and to claim victory in the upcoming elections? Is it true that the NGC is yet to complete registration formalities with the Political Parties Registration Commission? If this is true, then what is the difference between transforming the KKY Movement into a political party and joining it with an unregistered political party? Mathematically, 10 times 8 is the same as 8 times 10. Meaning if KKY Movement can be metamorphosed into NGC or any other political party, NGC and any other political party could also metamorphose into KKY Movement. 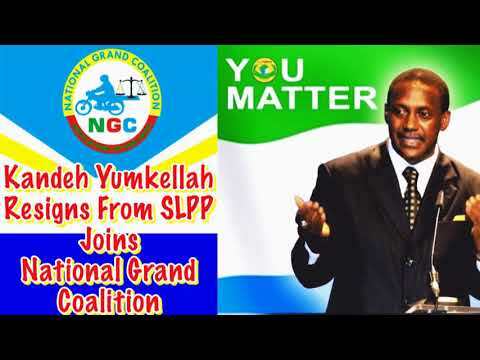 To me, Dr. Yumkella’s decision to join the NGC in this dying minute makes all the long fight for SLPP membership and its flagberership unnecessary. One could just imagine the beautiful result he could have achieved if he had invested all the time, money and energy into the formation of his own political party. Political success depends on popularity. I could see that the KKY Movement is more popular locally and globally than the NGC. The success, popularity and legitimacy of every social group begins with its logo/symbol. When I asked a friend who is a happy fan of NGC to explain to me the logical meaning of the NGC logo, he told me that the scale stands for justice and the motorbike (Okada) stands for a fast alternative to future prosperity. While I have no question against the scale standing for justice, I would like to know how many Sierra Leoneans would prefer Okada to a real car if not because of bad roads, dense traffic and lawlessness in the country? We all know that Okada is just another dangerous, unstable and lawless means of income for the thousands of jobless youths in the country. So if the Okada in NGC’s logo is to take us quickly to future prosperity, why not use a jet? Is this not just a ploy to attract Okada riders? Can the NGC become another Coalition 2016? When elections are over, coalition members returned back to their traditional parties because the coalition was formed only against the incumbent junta ruler. It existed constitutionally but it never existed in reality. When elections are over, break away members of APC and SLPP remain without any true political party, for they had formed an alliance against their own camps. The coalition has a strong grassroots support because it was formed by a special convention with 490 delegates, 70 from each of the 7 parties. 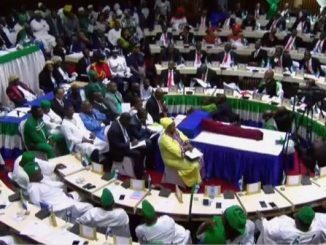 The ground work was based on past experiences in their quest to unseat Jammeh Such convention might not be necessary because KKY is joining the allaince with a group of supporters who have a willy-nilly quest to have him as their own president. Though other aspirants might feel bullied, but he will be the flagbearer by default. Is NGC different from PMDC? What made the Charles Margai’s PMDC effective was his alliance with the then main opposition APC, and his insatiable desire was not to claim the presidency but rather unseat SLPP by all means. The party was full of disgruntled SLPP supporters and some enlightened citizens who had seen APC and SLPP as the greatest nightmares of our life time. As Charles Margai hastily announced his alliance with APC to the detriment of SLPP, the expectation for positive political change began evaporating for many. Because every political pundits knew that APC yesterday plus/minus APC today will only sum up to another APC. The fact which remains unchanged nevertheless, is that the alliance succeeded against the ruling SLPP. Unlike the PMDC, NGC’s desire will be to unseat APC and SLPP at the same time. It’s true that many Sierra Leoneans, especially the young generation, are yarning for positive political change but their vote can not be enough to undo APC and SLPP in barely six months’ time. Hypothetically, the best possible candidates for the NGC are KKY and exiled vice president Sam Sumana, even though the latter’s membership of NGC is yet unsure. While Sam Sumana’s support lies in the sympathy he has won from his people as a result of the humiliation he suffered from APC, KKY’s strength lies in the diaspora based on his track records with the United Nations. Most unfortunately, participation of the diasporans in the political game is limited mainly to funding and the social media which does not reach majority of the eligible voters. Circulating media clips of KKY’s campaign messages and his past performances at the global stage cannot win him much vote on the ground because the average voter does not have access to it. Or even if they do, they can hardly understand the gist of his discussions. Therefore, a period of six months can only be a starter for the herculean campaign to change the grassroots voter’s mind-set about our country’s political landscape. Please connect me with KKY,I will like to say something to him.